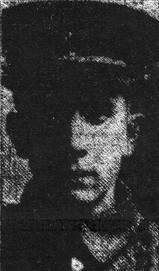 Private 253249, “B” Coy, 3rd Battalion, London Regiment (Royal Fusiliers). Enlisted Tonbridge. Killed in Action 8th October 1916 aged 20. Buried at Bienvillers Military Cemetery . Born in Leigh, Kent . Baptised on the 30th August 1896 at St Mary’s Leigh. Resided in Leigh, son of George and Mary Ann Booker of Forge Square, Leigh. 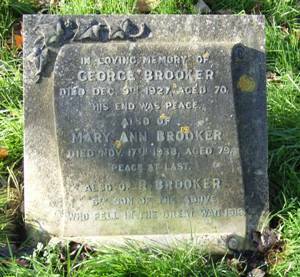 Remembered on parents gravestone as “Also of R Brooker 6th son of above who fell in the Great War 1916”. Mr and Mrs G. Brooker, of Forge Square , Leigh, have just received news that their son, Private Reginald Lewis Brooker, who was posted as missing on the 88th October 1916, died on that day or since. He joined the Royal West Kent Regiment in January 1916, and after six months training, during which time he became both a good shot and bomber, he was transferred to the London Regiment, and left England for France on the 31st August 1916 . Mr and Mrs Brooker have two other sons serving.